The Department of Public Works is a vital part of the village. Without the DPW, the village would pretty much come to a standstill. The DPW’s functions include record keeping, maintenance and future planning of the major/local streets, maintaining the water and sewer systems, and improvement/maintenance of the buildings and grounds of the village. They make sure that rules and regulations from the state and federal government are followed. The guys even do the maintenance on the village equipment, saving in repair costs. In 1972 Vermontville upgraded its wastewater treatment facilities to facultative lagoons to be in compliance with the Clean Water Act. Both DPW employees are certified and responsible for the proper operation, testing, treatment, monitoring and security of these lagoons. The Department of Public Works is made up of 2 full-time employees and can be reached by calling 517/726-1444, or by using the email links below. 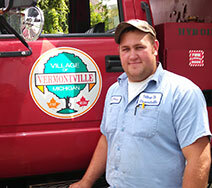 Chris was born and raised in Vermontville. Chris has worked for the Village since August, 2014. 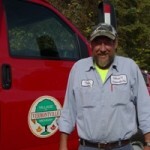 Chris and his wife Britiney are very active within the community, with both being active members in the Maple Syrup Corporation and Chris being a member of the Vermontville Township Fire Department. Chris and Britiney have two children, Avery and Brock. They enjoy serving their community, camping, being in the outdoors, and spending time with friends and family, including their dog Buzz. 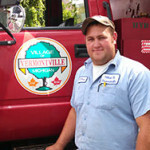 Terry is a lifelong resident of Vermontville and has worked for the Village since 2005. Terry and his wife Teresa have two children, Ashley and James. Terry spends his spare time hunting, fishing, and camping. Terry has received his certification in Water and Wastewater Operations. Other responsibilities include reading and/or replacing meters, performing maintenance on vehicles, and tending to the upkeep of the buildings and grounds.